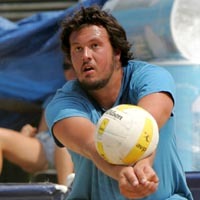 Conover began his collegiate career at Grossmont Junior College, where he was named all-state in 2002 and 2003. Transferred to Cal State Northridge, where he was chosen all-tournament at the prestigious 2005 Can-Am Challenge in Alberta, Canada. Greatest Accomplishment: Beating UCLA in the 2005 conference playoffs at Pauley Pavilion in the fifth game after trailing 14-10.